Hedge funds and large money managers usually invest with a focus on the long-term horizon and, therefore, short-lived dips on the charts, usually don’t make them change their opinion towards a company. This time it may be different. During the fourth quarter of 2018 we observed increased volatility and small-cap stocks underperformed the market. Hedge fund investor letters indicated that they are cutting their overall exposure, closing out some position and doubling down on others. 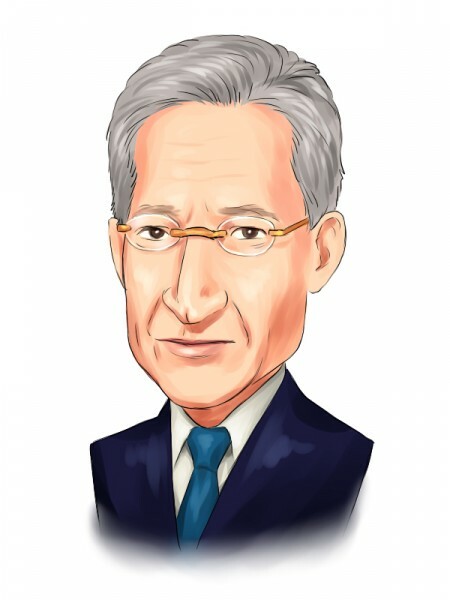 Let’s take a look at the hedge fund sentiment towards Dell Technologies Inc. (NYSE:DELL) to find out whether it was one of their high conviction long-term ideas. Dell Technologies Inc. (NYSE:DELL) shareholders have witnessed a decrease in hedge fund interest lately. DELL was in 43 hedge funds’ portfolios at the end of the fourth quarter of 2018. There were 61 hedge funds in our database with DELL holdings at the end of the previous quarter. Our calculations also showed that DELL isn’t among the 30 most popular stocks among hedge funds. We’re going to take a look at the recent hedge fund action regarding Dell Technologies Inc. (NYSE:DELL). What does the smart money think about Dell Technologies Inc. (NYSE:DELL)? At the end of the fourth quarter, a total of 43 of the hedge funds tracked by Insider Monkey were bullish on this stock, a change of -30% from one quarter earlier. 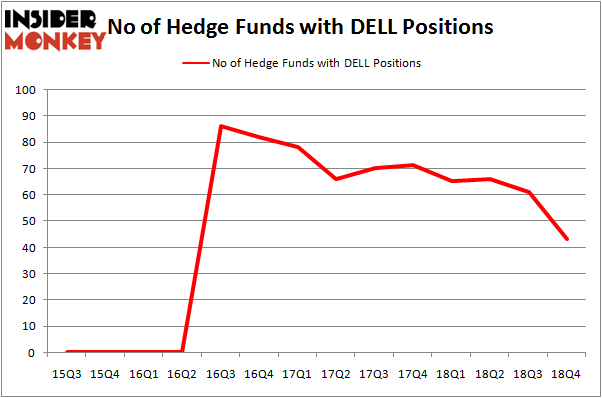 The graph below displays the number of hedge funds with bullish position in DELL over the last 14 quarters. With hedgies’ capital changing hands, there exists a few key hedge fund managers who were adding to their holdings meaningfully (or already accumulated large positions). More specifically, Icahn Capital LP was the largest shareholder of Dell Technologies Inc. (NYSE:DELL), with a stake worth $625.5 million reported as of the end of September. Trailing Icahn Capital LP was Elliott Management, which amassed a stake valued at $323.8 million. Canyon Capital Advisors, Farallon Capital, and Renaissance Technologies were also very fond of the stock, giving the stock large weights in their portfolios. Judging by the fact that Dell Technologies Inc. (NYSE:DELL) has experienced declining sentiment from hedge fund managers, it’s safe to say that there was a specific group of funds that slashed their positions entirely in the third quarter. Intriguingly, William B. Gray’s Orbis Investment Management cut the largest position of the 700 funds monitored by Insider Monkey, comprising close to $282.6 million in stock, and Kenneth Mario Garschina’s Mason Capital Management was right behind this move, as the fund cut about $247.1 million worth. These transactions are interesting, as total hedge fund interest was cut by 18 funds in the third quarter. Let’s go over hedge fund activity in other stocks similar to Dell Technologies Inc. (NYSE:DELL). We will take a look at China Petroleum & Chemical Corp (NYSE:SNP), Petroleo Brasileiro S.A. – Petrobras (NYSE:PBR), Bristol Myers Squibb Company (NYSE:BMY), and CVS Health Corporation (NYSE:CVS). This group of stocks’ market caps match DELL’s market cap. As you can see these stocks had an average of 45.5 hedge funds with bullish positions and the average amount invested in these stocks was $2174 million. That figure was $2171 million in DELL’s case. CVS Health Corporation (NYSE:CVS) is the most popular stock in this table. On the other hand China Petroleum & Chemical Corp (NYSE:SNP) is the least popular one with only 15 bullish hedge fund positions. Dell Technologies Inc. (NYSE:DELL) is not the least popular stock in this group but hedge fund interest is still below average. Our calculations showed that top 15 most popular stocks among hedge funds returned 19.7% through March 15th and outperformed the S&P 500 ETF (SPY) by 6.6 percentage points. Hedge funds were also right about betting on Dell as the stock returned 23.2% and outperformed the market as well.